Over the last fifteen years, psychological research regarding sexual orientation has seen explosive growth. In this book, Anthony R. D'Augelli and Charlotte J. Patterson bring together top experts to offer a comprehensive overview of what we have discovered--and what we still need to learn--about lesbian, gay, and bisexual identities. Writing in clear, nontechnical language, the contributors cover a range of topics, including conceptions of sexual identity, development over the lifespan, family and other personal relationships, parenting, and bigotry and discrimination. 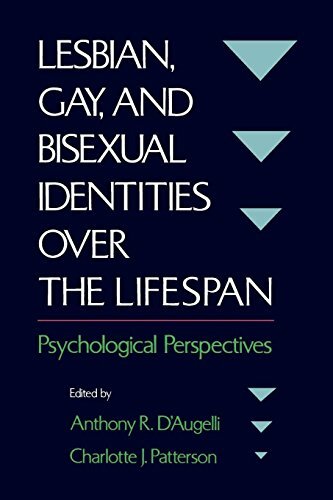 Lesbian, Gay, and Bisexual Identities Over the Lifespan is essential reading for researchers, students, social scientists, mental health practitioners, and general readers who seek the most up-to-date and authoritative treatment of the subject available. If you have any questions about this product by Anthony R D Augelli, contact us by completing and submitting the form below. If you are looking for a specif part number, please include it with your message.